Tony J. Selimi is internationally known as Human Behavior, Cognition, and Emotional Intelligence Expert. The See-Through coach and an award-winning and best-selling author of A Path to Wisdom and #Loneliness who specializes in assisting people unleash their true potential, accelerate their learning, and achieve excellence in all of the eight key areas of life-spiritual, mental, emotional, physical, career, business, financial and love. Like a transparent mirror, Tony is known for his ability to see through people’s problems, unconscious behaviors, thought patterns skewed perceptions, and dis-empowering beliefs that prevent them from creating astronomical visions, results they desire, and lifestyle they dream about. He helps them clarify their values, expand their life’s vision and mission, and tap into the infinite wisdom of their interstellar existence. As a business consultant he globally provides answers to questions and practical solutions to life’s challenges in talks, workshops, one to one coaching, mastermind groups, retreats, articles, radio and TV interviews as well as through his books and online downloads of the TJS Evolutionary Meditation Solutions. #Loneliness: The Virus Of The Modern Age by Tony Selimi is the warm embrace a world suffering from a devastating epidemic of self-doubt, rejection, and loneliness desperately needs. From the first pages of his book, Tony Selimi assures his readers that they are indeed in the right place at the right time and, in fact, they are the cure to this epidemic of loneliness that threatens to cripple us all. In #Loneliness: The Virus Of The Modern Age, bestselling, award-winning author and human behavior, cognition and emotional intelligence expert Tony Selimi peels back the layers of his life and reveals the shame and guilt, repressed sexuality and fear he experienced as a homeless war refugee turned family man and high level corporate IT manager. In a moment that might have been predicted to be his cataclysmic failure, author Tony Selimi tells us how he found the courage to walk away from his already successful life and turn towards his most powerful inner truth. In a way that is intended to evoke our own transformational powers, Tony Selimi shares how he began the arduous journey of reclaiming his life and stepping into his destiny as a successful entrepreneur, highly acclaimed international speaker, and respected spiritual teacher and healer. Today he shares hope and hard-earned wisdom about loneliness and power with the world through the pages of #Loneliness: The Virus Of The Modern Age, his award-winning books, training, and programs. Well written, thought provoking and deeply inspiring, #Loneliness: The Virus Of The Modern Age doesn't just tell us his phenomenal story of success and genuine happiness and leave us admiring his success and achievement, but informs us about the facts behind the epidemic of loneliness, and gently guides us with his five-step AWARE formula and power-filled “light bulb” moments to find the courage to reclaim our own health, wealth, and happiness. It’s been said that to get better answers, we've got to learn how to ask better questions. In #Loneliness, Tony Selimi offers us not one, but many great questions. Questions like, “What can you do daily to activate your light and remain switched on?" dare us to not just survive loneliness, depression and anxiety, but to find the fire that ignites and transforms us. Step by step, chapter by chapter, Tony Selimi challenges us not to just learn from and celebrate his journey from loneliness to greatness, but rather he offers a well crafted tool designed to empower and heal our lives so that we then can join efforts in creating an epidemic of hope and healing on the planet. #Loneliness: The Virus of the Modern Age by Tony Jeton Selimi is a powerful and timely book that addresses one of the universal problems of our age, a problem that stares most of us in the face continually. In today’s fast-paced culture and eclectic technological environment, it is easy to get absorbed in the tools of communication without actually grasping the essentials of connectivity. Loneliness becomes more and more of a grave concern for modern man and, at a time when communication tools become more and more perfect and effective, it is ironic that in a crowd of a million people someone feels terribly lonely. In this ground-breaking work, Selimi takes readers on a less-travelled path to uncover the root causes of loneliness, explaining in simple, yet powerful terms how loneliness can affect our well being and how it is a deadly cancer; and finally proposing a roadmap to living a life of profound connectivity with self, others, and the world around us. If there is a book that everyone needs to read in the area of personal development, it is #Loneliness: The Virus of the Modern Age by Tony Jeton Selimi, and the author’s experiences will ring powerful bells in the minds of readers. There were many instances where I had to say, “Yes, I have been there. I can relate.” The author combines years of research with personal experiences to deliver an eye-opening message the world has needed for a very long time. You’ll look at yourself differently and develop a different approach to relationships --- both personal and professional. It is interesting to see how the author leads readers to the understanding that the way we connect with ourselves can be the secret to success in life and business. One powerful take away point: It’s in moments of uncertainty and fear that we become easily manipulated. #Loneliness: The Virus of The Modern Age by Tony Jeton Selimi is an inspiration non-fiction book on loneliness, interwoven with the author’s own personal life experiences. #Loneliness starts off with Tony’s own childhood and past experiences, including bouts with illness, abuse, and homelessness. From there, the book moves onto discussing in depth the modern plague of mankind — loneliness - and how it can often derive from guilt or shame. In a world where technology and the need for independence moves people apart, the effects of feeling alone and isolated are only felt when it is sometimes too late. The book presents a comprehensive perspective of how inter-connectedness with people is vital to health and survival in humans. Without the sense of acceptance and belonging that comes with the knowledge that there are people in our world who care about us and whom we care about, the world is an empty place. The book is broken down into various chapters and delves into the areas of psychology, mentality, history, and spirituality, among others, to discuss loneliness, its causes, and its toxic effects. In the end, the book shows us that the need to belong and feel connected is a basic necessity of life. 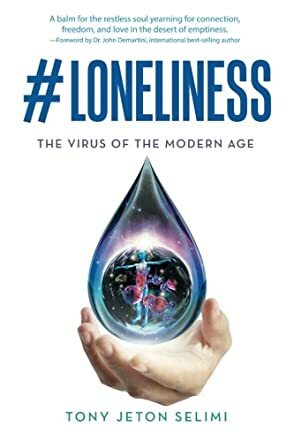 #Loneliness: The Virus of The Modern Age by Tony Jeton Selimi is a very well-presented book. Tony’s own personal life stories and experiences add an extra dimension that almost make this a part-memoir. More importantly, a book like this is necessary in today’s increasingly isolated world where, although distances are shorter, human beings are less connected to their fellow humans than ever before. The devastating effects of loneliness are well explained and this can be a good self-help book for people struggling to find meaning in their lives. I have always thought that loneliness is just a natural part of the human condition. I never really considered it a virus or disease that there might be a cure for. Since reading Loneliness: The Virus of the Modern Age, I have had to rethink all of my ideas about loneliness, as well as many of my ideas about life. This is a very powerful book, written by a very smart, educated, and compassionate man. Loneliness: The Virus of the Modern Age is not only well written and logically structured, but also provides real techniques and advice which you can immediately put into practice for the improvement of all areas of your life. Tony J. Selimi has a vision and by sharing his knowledge he improves himself and the world. Loneliness: The Virus of the Modern Age is easy to read, but at its core it is full of very lofty ideas and ideals. I like anything positive. I like ides that help individuals and contribute to the betterment of mankind. We need this more than ever today and this book is a good example of how each of us can make a contribution, no matter what obstacles we have had to overcome. Tony J. Selimi talks about his own negative experiences and how he overcame them. Then he gives you practical advice based on his own experiences. I like this approach. I like this book. I think it will help a lot of people. The ALARM method and the eight facades are truly evolutionary teachings that can help you on the road to a better you. #Loneliness: The Virus of the Modern Age by Tony Jeton Selimi begins with the memoirs of its author, born in the former, pre-war Yugoslavia. He shares an upbringing that encompasses everything we fear a child might experience, but pray they will not — physical disabilities and sexual abuse. As a teenager, he is front and center during the war and subsequent dissolution of Yugoslavia, resulting in his emigration to the United Kingdom. After a rocky start inflamed by homelessness and financial difficulty, and an unfortunate marriage where an inner conflict of sexual identity rages, Selimi finds his feet and his voice, making a bold professional and personal move that alters everything. Readers are then versed in the scientific evolution of loneliness, a breakdown of how and what impacts it, and where we can make proactive, positive changes that not only help us individually, but have wide-reaching global impact. When I first picked up #Loneliness: The Virus of the Modern Age by Tony Jeton Selimi, I was expecting little more than a run-of-the-mill self-help tutorial. I was thoroughly rewarded by what came next. First of all, Selimi's story is heartbreaking. It is powerful and poignant enough to be a stand-alone book, but is fundamental to the theories he presents afterward. The struggles and the situations he rises from — which feel desperately hopeless — lend to his credibility far more than any educational acronym found after the names of most self-help authors. When the story is told, the subsequent theories are supported by facts and evidence, in addition to Selimi's applied knowledge. This is done with a clear desire to reach the reader on a human level, and feels more like a conversation with a friend. I recommend #Loneliness: The Virus of the Modern Age to anyone who has experienced any form of loneliness, has been sucked into "Facebook envy," or other feelings of unworthiness fueled by the artificial, manipulative world we find ourselves in today.